Sports Marketing Triple Play: Team, Retailer, Shoppers Win in Free Furniture Promo – StratGo Marketing. Plug-in marketing department services. Credit: Ashley Furniture – College Station, TX. The Texas A&M football team made a lot of furniture shoppers very happy last week when they beat South Carolina 52-28. The margin of victory in A&M’s season-opening win meant that customers of Ashley Furniture HomeStore in College Station, TX would get their just-purchased furniture for free. It was an exciting moment for the team, store and customers. Maybe not so much for the insurance company. Learn more in this mini case study, plus four keys to your sponsorship and sports marketing success. The locally owned and operated store is based in College Station, Texas. The Promotion. Offer: If Texas A&M beats South Carolina by 10 points on August 28th, all furniture purchased during the August 16-27 promotional period will be free (money to be refunded to consumers). At game time, home team South Carolina was favored by 10 1/2 points. College football is king in certain parts of the country, especially College Station, TX, home of Texas A&M University. Passionate fans are an understatement. In fact, the famous “12th Man” tradition started here. The first rule of thumb in sponsorship marketing (after setting your strategy) is identifying and selecting the right platform. Sure, if you’re a College Station, TX retailer, creating tie-ins to the Texas A&M football team is a no-brainer. But not every situation is that obvious. You have to do your homework, and that’s why excellent market and customer knowledge is a critical advantage to get both the platform and the offer right. Ashley knew that, even though South Carolina was favored, A&M fans believed the team had a good chance to win, which underpinned the promotion and fueled the pre-game excitement. Inking the sponsorship deal is just the beginning. You need a marketing plan to activate and truly leverage the sponsorship. Create awareness, build excitement and drive traffic – or do whatever needs to be done to achieve your objectives. Execute well. Per news reports, the College Station Ashley store posted more than $1 million in sales from the promotion. August was the highest sales month in the store’s eight-year operating history. With insurance costs estimated at only 15% of promotional revenues, it’s no wonder he was smiling. However, promo period sales may end up cannibalizing sales in September or October, but hopefully the store factored that into its pre-event financial calculations. 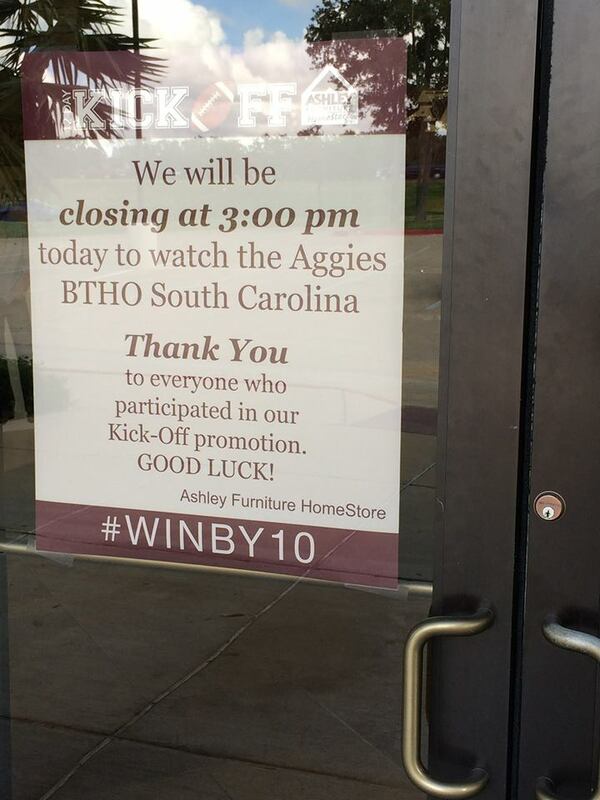 Ashley Furniture HomeStore in College Station, TX powered a sports marketing triple play when its free furniture offer activated following Texas A&M’s season-opening football victory. Plus, four keys to your sponsorship and sports marketing success.